CBS caused a storm in sci-fi circles when they announced that they were rebooting the iconic, world renowned Star Trek. Not just another tale set in the universe, but they decided to start from scratch. Setting it ten years before the adventures of the USS Enterprise. What also caused a stir was the main character was not the captain of the ship but a renegade commander. What they have done is monumental in the sci-fi world as the original time line (Kirk, Spock et al) is now defunct and all future episodes will follow a new time line. Do not fear as Discovery follows in the vein of Gene Roddenberry’s dream of the human race’s peaceful exploration of space. USS Shenzhou is at the edge of Federation space attending to a damaged satellite when they come across a large object that they can’t quite read with their sensors. 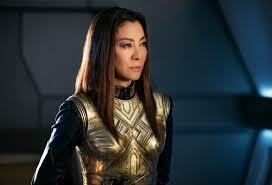 Captain Philippa Georgiou (Michelle Yeoh, The Mummy: Tomb of the Dragon Emperor, Guardians of the Galaxy: Vol. 2) accepts her First Officer Michael Burnham’s (Sonequa Martin-Green, Yelling to the Sky, The Walking Dead) offer to investigate. What she finds is an ancient, carved vessel, whilst studying the vessel she is attacked by a Klingon, she flees but during her escape she accidentally kills the Klingon. This sets off a chain of events leading the Klingon’s to call for war against the Federation. T’Kuvma (Chris Obi, Ghost in the Shell) wants to re-unite the twenty four Klingon clans as was done in the distant past as the Klingon soldier that was killed by Burnham was the ‘Torchbearer’ of the ancient prophecy. To get himself back into the good books of the Klingon high command, Voq (Shazad Latif, The Second Best Exotic Marigold Hotel) volunteers to take his place. Being at the start of a war the captain tries to talk peace but the Klingon’s will have none of it and Burnham believes that they should strike first and snuff out this before it gets out of hand. Georgiou refuses to give up on diplomacy, but Burnham ignores that and tries to fire on the Klingon ship. 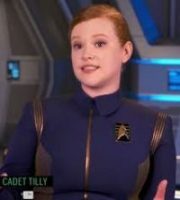 Burnham is arrested for mutiny and ends up on the USS Discovery for her imprisonment. How do you resolve a problem like the Klingon’s? 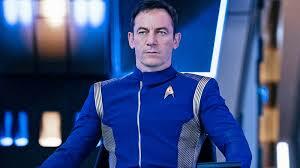 The crew of the Discovery must work to end the war with the Klingon’s with new technology and parallel time lines and new aliens; this is the Universe that is Star Trek. With Captain Gabriel Lorca (Jason Isaacs, Harry Potter and the Deathly Hallows: Part 1), Paul Stamets (Anthony Rapp, A Beautiful Mind), Sylvia Tilly (Mary Wiseman, Longmire) and Sarek (James Frain, All Things to All Men) to keep the USS Discovery in one piece. 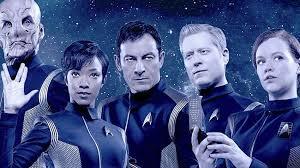 This series will be the ‘Marmite’ of the Star Trek Universe, you’ll either love it or hate it. 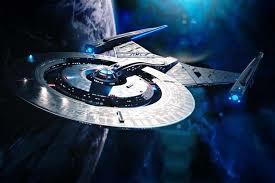 We love it and I have watched every episode of every incarnation of Gene Roddenberry’s dream. This is darker and grittier than the TOS, but war is.